Charles Dickens gave this sincere speech in Sheffield, the city of steel factories, in December 1855, on being presented by the mayor with a service of cutlery. It is unbelievable, perhaps, but it is true: that, too, is the voice of the most avant-garde European novelist of the nineteenth century. Of all his impersonations, Dickens’s greatest was his fluent mimicry of what the bourgeois public imagined that a novelist should be--through prefaces to his novels, which offered doctored accounts of their geneses as serial sketches in magazines; through his efforts on behalf of the Guild of Literature and Art, or his work with the Royal Literary Fund; through his collected editions (he supervised the following editions: the Charles Dickens, the Cheap, the Library, the Diamond, the People’s, and the Hachette). He had a mania for canonization, for the public paraphernalia of authorship. And this extended, most importantly, to his biography. Dickens died in June 1870. Seventeen months later, in November 1871, the first Life of Dickens was published by his friend John Forster--an eminent man of letters, the biographer of Goldsmith, Swift, and Landor--who had been appointed Dickens’s biographer by Dickens himself. Dickens gave Forster autobiographical fragments, manuscripts, letters--which were all to be kept secret until the posthumous biography. On its publication, it revealed how autobiographical much of his writing had been--“watered,” as one critic wrote, “with tears of self-compassion.” The pain in Dickens, it turned out, was less a moral philosophy than a natural identification with the marginalized, the defenseless, the lost. And yet such autobiographical pain did nothing to change the essential idea of Dickens as a moralist, and of his novels as didactic agents of social comment. But the era of psychology, and of social reform, were not alive to the energy in Dickens’s art. His real greatness, I think, lay elsewhere: in his savage, magical style. With the appearance of Michael Slater’s extraordinary biography, which exuberantly tracks the mercurial energy of Dickens’s publication history--as well as his editing and his public readings--it is possible to be accurate to Dickens’s wild originality, the career of his career. This is a biography of a writer as writer. It is therefore quite unique. “Overfamiliar metaphor,” writes Kundera in The Art of the Novel: “The novelist destroys the house of his life and uses its stones to build the house of his novel. A novelist’s biographers thus undo what a novelist has done, and redo what he undid.” This is not true of Slater. “All their labor cannot illuminate either the value or the meaning of a novel,” adds Kundera. I have always agreed with him; but this great book allows one to imagine a more delicate biographical form--a heuristic instrument for the analysis of spectral themes. For Dickens’s life--like one of his novels, with its parallel plot--was ghosted by two central motifs. He is the connoisseur of characters acquiring, in the words of the old cliché, a life of their own--like Dr. Marigold, who “came flashing up in the most cheerful manner, and I had only to look on and leisurely describe it.” But he is also the connoisseur of corpses. In Paris, the hidden twin to Dickens’s London, his favorite destination was the morgue. Dickens digested the dead with gusto. He was drawn to the morgue--“dragged by invisible force,” by “the attraction of repulsion.” And this is Dickens’s subject, the invention of his style: the uneasy, queasy hinterland where it is alluringly unclear what is alive and what is not. Is it so difficult and can an outsider understand that you experience a story within yourself from its beginning, from the distant point up to the approaching locomotives of steel, coal, and steam, and you don’t abandon it even now, but want to be pursued by it and have time for it, therefore are pursued by it and of your own volition run before it wherever it may thrust and wherever you may lure it. In this marvelous sentence, where the subject writing and the subject written sinuously swap places, Kafka identifies the mobile essence of Dickens’s lesson for fiction. His great subject is the force that gives anything animation at all. His work constitutes a sustained examination of the conditions for lifelikeness. Dickens can animate anything. Even an oyster opener: for what happens to oyster openers, wonders Dickens, in an improvised moment in a letter from Montreal in 1842, when oysters are out of season? “Do they commit suicide in despair, or wrench open tight drawers and cupboards and hermetically-sealed bottles for practice? Perhaps they are dentists out of the oyster season. Who knows?” Dickens’s animating style discovers the uncanny energy of the commonplace. For Dickens is the great novelist of junk: the décor of hotel restaurants, the clutter of secondhand shops, the wallpaper in pretentious dance schools. London was supremely the city of the industrial, and the industrial was so savagely modern that it was impossible to keep up: everyone lived among the outmoded, among cherished objects which had lost their use value. This was Dickens’s discovery--the surreal poetry of what is obsolete, or seems to be obsolete. His life was spent observing how much a life became a collection of useless, loved objects. The walls were garnished with one or two large maps; and several weather-beaten rough great coats, with complicated capes, dangled from a long row of pegs in one corner. The mantel-shelf was ornamented with a wooden inkstand, containing one stump of a pen and half a wafer, a road-book and directory, a county history minus the cover, and the mortal remains of a trout in a glass coffin. We have a most extraordinary partiality for lounging about in the streets. Whenever we have an hour to spare, there is nothing that we enjoy more than a little amateur vagrancy--walking up one street and down another, and staring into shop windows, and gazing about us as if, instead of being on intimate terms with every shop and house in Holborn, the Strand, Fleet-street and Cheapside, the whole were an unknown region to our wondering mind. Dickens had the talent not to be averse to the shameful emotions--prurience, or curiosity, or self-deception, or hypocrisy: the shameful emotions without which no noble knowledge would ever be acquired. His style was formed in the voyeuristic city--London, with “that great heavy canopy,” as he wrote to Bulwer Lytton in 1851, “lowering over the housetops.” The walker alive to the smoggy city of junk: this was Dickens. And the usefulness of the city was very simple. London was a laboratory where the human was transformed into surface in as concentrated a form as possible. Or, as one of his best critics, John Carey, puts it, Dickens’s territory was “the border country between people and things, where Dickens’s imagination is mostly engaged.” And so it was where everything was always on the point of transforming from the animate into the inanimate, or vice versa. For anything, and anyone, can undergo a metamorphosis: it just depends on the strength of someone else’s will, desire, fetish--or belief. In his novels of reanimation, Dickens went for ghosts, for guilt, for bottled fetuses and effigies: for murder. His necromantic imagination needed corpses. Dead bodies are his constant prop. What else could he do? His subject was how strange the transition was between the live and the dead. But the motifs are all subject to the mechanics of his sentences. A sentence, for Dickens, was the medium in which he could investigate how reversible lifelikeness was. The effect of Slater’s book--so lavishly truffled with quotations from the vast range of his prose--is to emphasize how thoroughly Dickens was inhabited by this process of style. His life was itself a constant experiment of writing, of quickening by form. And so we must take the time to enumerate the elements of Dickens’s sentences. They constitute the true events, after all, of any novelist’s biography. In 1869, in his inaugural address as president of the Birmingham & Midland Institute, Dickens confessed something to his audience: “My own invention or imagination, such as it is, I can most truthfully assure you, would never have served me as it has, but for the habit of commonplace, humble, patient, daily, toiling, drudging attention.” Drudgery is the ritual of Dickensian transformation. It enabled inspired detailing, such as a slum with its “starved white horse who was making a meal of oyster-shells.” And it also produced exuberant squiggles: a child reading the newspapers, “which are so very large in proportion to himself, shorn of his hat, that when he holds up The Times to run his eye over the columns, he seems to have retired for the night, and to have disappeared under the bedclothes.” And it emerged in the full dense complexity of a sentence like this: “Smoke lowering down from chimney-pots, making a soft black drizzle, with flakes of soot in it as big as full-grown snow-flakes--gone into mourning, one might imagine, for the death of the sun.” The sentence describes a comic apocalypse--but then Dickens’s style itself may be called a comic apocalypse, energized by the twin engines of personification and metaphor, where everything and everyone can be transformed into the uncannily alive or the uncannily dead. So it becomes impossible to say how far a metaphor is ornament, or instead a precise description of what is seen. the Harmonic Meeting at the Sol’s Arms; where the sound of the piano through the partly-opened windows jingles out into the court, and where Little Swills, after keeping the lovers of harmony in a roar like a very Yorick, may now be heard taking the gruff line in a concerted piece, and sentimentally adjuring his friends and patrons to Listen, listen, listen, Tew the wa-ter-Fall! The profound innovation of Dickens’s style is in this way of describing the human as endless superficiality, infinitely bathetic: a bricolage of bric-a-brac. His profundity is precisely in the refusal of depth. He is often attacked for the creation of caricatures, not characters. As a binary opposition, this seems as uselessly simplistic as Forster’s division of characters into the flat and the round. It fails to honor the way his vision of what is real, what is alive, is tense with what is dead. His characters, therefore, are necessarily collections of repetitions. When describing the character of Skimpole in Bleak House, Dickens described him as “a delightful manner reproducing itself under my hand.” A character, for Dickens, is a self-reproducing entity; as artificial as a self--another system of repetition. “We are all weak creeturs,” said Mrs. Corney, laying down a general principle. “So we are,” said the beadle. Nothing was said, on either side, for a minute or two afterwards. By the expiration of that time, Mr. Bumble had illustrated the position by removing his left arm from the back of Mrs. Corney’s chair, where it had previously rested, to Mrs. Corney’s apron-string, round which it gradually became entwined. “We are all weak creeturs,” said Mr. Bumble. Every novel by Dickens is already an illustrated novel. The actual illustrations are just confirmations, tautologies. But it is not just the sentences. Dickens’s form is the novel, after all. His plots, like his sentences, are forms of resurrection. All Dickens’s great novels--from Dombey and Son, through Bleak House and Little Dorrit, to Our Mutual Friend--use multiple plots that resolve themselves, gradually, into one: characters are reborn under new names, or discover their true bloodline. Each individual plotline seems unrelated. But every novel turns out, in the end, to be a family romance. And this formal property possesses its artisanal double; the resurrections of Dickens’s style--from Dombey and Son onward--were facilitated by his new way of working: to use folded sheets of paper, divided into sections, to plan out his novels in their serial parts and chapters. With this, he planned the ballet of his characters, the choreography of his plots. Early in his career, in Oliver Twist, Dickens defended the novel as a place for steep transitions--like “all good murderous melodramas” where the comic and the tragic alternate, “as the layers of red and white in a side of streaky bacon.” Some readers thought that this was overly dramatic, but for Dickens it was the structure of “real life.” The difference was that in real life we did not notice the transitions “from well-spread boards to death-beds, and from mourning weeds to holiday garments,” because “there, we are busy actors, instead of passive lookers-on.” This principle of transition was the central method by which Dickens constructed a fiction. Like a morgue, it was a system that produced the irony of transition: the abrupt juxtaposition of the living and the dead. It was a lesson, the reader discovers, that he would learn himself. (Life is so philistine in its exaggerated care for form!) On April 14, 1851, Dickens gave a speech to the General Theatrical Fund dinner, praising the resilience of the actor who came “from scenes of affliction and misfortune--even from death itself--to play his part before us.” And then Dickens left the dinner--and was told that his infant daughter, “with whom he had been happily playing just before leaving home,” had died. Dickens, the novelist, impersonated Providence. This is another way of saying that he impersonated the city. It is the city, after all, where such fateful parallels happen with the densest rhythm. The city, as Eisenstein knew, is where montage was invented: “that head-spinning tempo of changing impressions with which Dickens sketches the city in the form of a dynamic (montage) picture.” London was the capital of the nineteenth century, and its form was montage. But this does not imply that Dickens had a coherent politics. In his essay, Eisenstein criticized the implications of Griffith’s montage: “the structure that is reflected in the concept of Griffith’s montage is the structure of bourgeois society.... And this society, perceived only as a contrast between the haves and the have-nots, is reflected in the consciousness of Griffith no deeper than the image of an intricate race between two parallel lines.” Eisenstein, I assume, would have been similarly infuriated by Dickens. Dickens, after all, annoyed Brecht, and he dismayed Lukács, who lamented “the limitations of Dickens’s social criticism, his sometimes abstract-moral attitude towards concrete social-moral phenomena.” But why must Dickens have a politics? He was a novelist. He had a style instead. Mrs. Piper lives in the court (which her husband is a cabinet-maker), and it has long been well beknown among the neighbours (counting from the day next but one before the half-baptizing of Alexander James Piper aged eighteen months and four days old on accounts of not being expected to live such was the sufferings gentlemen of that child in his gums) as the Plaintive--so Mrs. Piper insists on calling the deceased--was reported to have sold himself. Mrs. Piper is just a flicker in that vast electric network that Dickens called Bleak House--and she is permanent. With Mrs. Piper, the reader comes upon the center of Dickens’s life-giving style, in the care lavished so quickly on lesser figures. For there is also truth in cliché, in the way a self freezes into its gestures. In the end, the self can be content with very little--like a cabman who is given twopence, which he receives “with anything but transport, tosses the money into the air, catches it over-handed, and retires.” Nabokov commented: “this gesture, this one gesture, with its epithet ‘over-handed’--a trifle--but the man is alive forever in a good reader’s mind.” And then he added: “A great writer’s world is indeed a magic democracy where even some very minor character ... has the right to live and breed.” This, in the end, is the flimsy, ethereal, convincing politics of Dickens’s prose: not in his speeches, or his newspaper campaigns, but in the democracy of his fiction, in its massive crowd of animate extras. The medium in which these minor characters lived was the mixing and refining solution of Dickens’s voice. Among all the Dickensian system of repetitions, the most repeated element is Dickens himself: his prose style. At his audience with Queen Victoria in 1870, he may have commiserated sedately over “the price of butchers’ meat, and bread,” but he was really a revolution of one. And the key to this revolution, to this style, may be found in his performances. Around 1843, when he was writing A Christmas Carol, Dickens changed the way he wrote. He developed a more performative system of punctuation: a musical notation of semicolons. And it was also in A Christmas Carol that Dickens allowed his prose to become an electric message between the novelist and the absent reader: “Scrooge, starting up into a half-recumbent attitude, found himself face to face with the unearthly visitor who drew them: as close to it as I am now to you, and I am standing in the spirit at your elbow.” When he came to give his famous performed readings, he chose to begin with A Christmas Carol--but he cut that passage, because at last there was no need to remind the absent reader of the absent novelist’s presence. 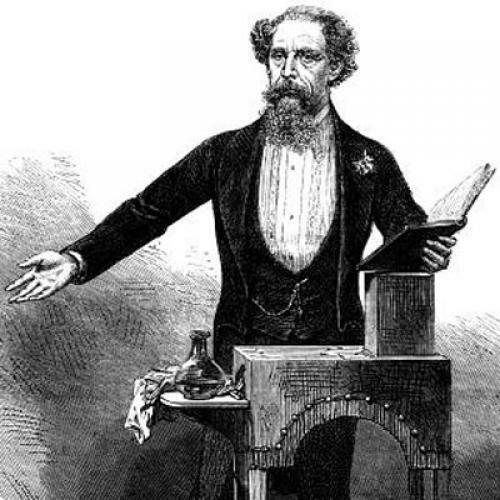 Before he became a novelist, Dickens had considered becoming an actor. With his assiduous precision, he had practiced “even such things as walking in and out, and sitting down in a chair.” His hero was Charles Matthews, who would come on stage as himself, in evening dress--and then play all the parts, culminating in a final bravura “monopolylogue.” It was an early form of stand-up. And this solo performance of multiple imitations formed the nucleus of Dickens’s style: a new form of prose, based on mimicry. Mimicry, of course, is based on an idea of the human as repetition. “How easily peculiarities may be acquired by negligence,” observed Matthews, “and how difficult they are to eradicate when strengthened by habit.” Dickens made this offhand observation central to the art of the novel: a sustained analysis of how far the repetitive is the essence of a character, or the appropriation of a self by the other. Dickens is the great comic impersonator. In the vocabulary of the nineteenth century, he is the great assumer. He impersonated other people, and he impersonated himself. This is why his biography is of such prickly and absorbing interest. He performed his own multiple imagination. There were two people in him, he told me: one who feels as he ought to feel and one who feels the opposite. From the one who feels the opposite I make my evil characters, from the one who feels as a man ought to feel I try to live my life. Only two people? I asked. Toward the end of his life, Dickens decided to add to his repertory of readings the murder of Nancy by her lover Bill Sikes in Oliver Twist. In performance, he continued to create the tale, to embellish the novel, adding extra detail--such as Sikes’s dog, his paws bloodstained, “crawling as if those stains had poisoned him! !” Famously, his enactment of the guilty murderer made Dickens feel like a murderer: he wrote to the painter Frith in November 1868 that his acting was “horribly like, I am afraid”--“I have a vague sense of being ‘wanted’ as I walk about the streets.” A short while earlier, in April 1867, Dickens had written to his friend Robert Lytton that with his performed readings, with “this interpretation of myself (then quite strange in the public ear),” he had hoped to hint at “some new expression of the meaning of my books.” The new meaning, I think, was simple. It was the living proof that Dickens--with gas jets rigged up to shine brightly on his face, because he was, after all, the flaneur of gaslight--had invented the narrator as impersonator. there was a wolfish stare at the object.... And there was a much more general, purposeless, vacant staring at it--like looking at waxwork, without a catalogue, and not knowing what to make of it. But all these expressions concurred in possessing the one underlying expression of looking at something that could not return a look. The Paris morgue was the hidden, concentrated form of London--of life. In the horrified italics of this asymmetrical looking, where the world is observed in the form of a waxwork, the disturbed energy of Dickens’s art and life may be found. So horrified by the inanimate, by the world’s junk, Dickens gave himself the infinite task of quickening everything, of impersonating everything--a demiurgic task of animation, through the precarious immortality of art. Adam Thirlwell is the author of The Delighted States, which will appear in paperback from Picador in the spring. His novel The Escape will be published by Farrar, Straus and Giroux next year.